It saddens me that the bulk of wine sold in the UK is around £5 a bottle or less. 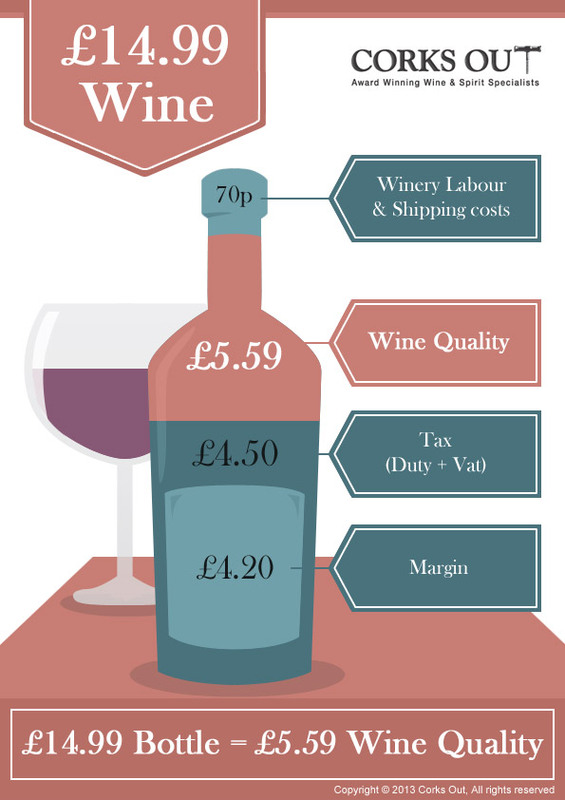 In fact, the average price of a bottle of wine sold retail in the UK is just £5.03. While there are a few genuine wine bargains out there, the good people at Corks Out have calculated that, on average, a £5 bottle of wine contains under 20 pence worth of wine at the winery. I've heard other calculations take this as high as almost a pound, but the bottom line is, what you're getting for your money is quite possibly the dregs at the bottom of the barrel. If you just want to get drunk, have you considered vodka? Not that it's tax free. Duty on a 70cl, 40% alcohol bottle of spirits is £7.90! Spend a little more, say £7, around the price that most of the wines we suggest for Wine of the Week, and you'll be getting 8 times more wine value... Now surely that extra £2 seems worthwhile? Moving up to £10 a bottle, almost 30% of the cost of the bottle is wine, compared to a paltry 3% for the £5 bottle... 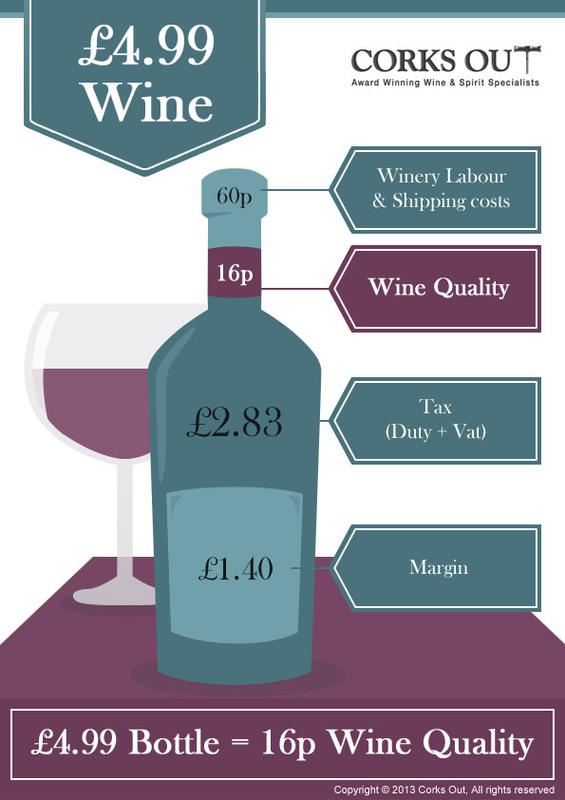 Here, your wine is worth £2.93. I don't want to get political here, it's not that any other party is likely to slash the tax on our tipples. So I'll remind you about a blog post we did back in June where a group of my dancing friends got together to compare £5 and £15 wines. The results were compelling, with virtually all 15 of us electing for the more expensive wine in a blind tasting of 15 wines. The one exception was a Serbian wine, not currently for sale in the UK but likely to retail at under £8, which is made in a small independent winery by a very passionate winemaker. Yes, bargains are out there, but on the whole, it really can be worth spending more. We had a real sceptic in our midst that night. He barely drunk wine at all. On arrival, he mentioned how he couldn't believe that the same grape could possibly be worth 3x as much per bottle. By the end of the evening, we'd almost created a oenophile out of him, but of course, only those in the £15 price bracket. His girlfriend still hasn't quite forgiven me for forcing her to share her premium Alsace Gewurz and losing a guaranteed designated driver in one fell swoop. Not convinced? I know it's tough out there at the moment, and we're all struggling with higher bills and we have to prioritise our spend. But consider this, at £15 a bottle, the wine in your glass finally costs more than your non-voluntary contribution to HM Revenue and Customs. That certainly makes me think. I'll freely admit that I don't drink £15 bottles of wine every time. If only! (Perhaps if you click on my advertising banners, recommend me to your friends, organise Purple Teeth wine tasting events, and use me for your bespoke gift services, I'll get closer to doing that!). But when I can splash out, I most certainly enjoy the £15 wines more, and, if push came to shove, I'd probably rather have one £15 bottle than 2 at £7.50 because the goal is not simply to get drunk. It's to experience something of the winemaker's intention, taste the sunshine that ripened his grapes, admire the expression of the variety of grapes out there, visit a land we may never see through our wine glass, and most of all, enjoy sharing that experience with our companions. I could evangelise on this subject for pages, but what really matters here, is whether or not you believe me, by tasting it for yourself. While I'd be more than happy to host an online £5 versus £15 tasting for my readership, or even to come round and show you for myself, the best way is probably just for you to try it. So, my challenge to you for our 20th Wine of the Week blog, is to pick a grape or wine that you regularly buy in the £5-7 range. Drink it critically. Examine the wine as if it were the first time you'd tasted it. Then, buy another wine from the same country and same grape if possible, this time, spending more than you normally would - whether that's a £10, £15 or £20 wine, I will leave to you. Again, drink it critically. See what you notice. Does the flavour linger longer between sips? Do you feel like enjoying it more slowly? Does it make you want to turn the conversation to the wine, rather than the wine simply lubricating your banter about the season finale of Dexter or Breaking Bad? Write to me via twitter, my facebook page, or the comments feed here. Tell me what you think. Does the experiment make you think differently about your wine experiences? I will, as usual, conduct some experiments of my own and report back in a couple of weeks. Meanwhile, always remember to drink responsibly, and enjoy wine with friends. Click here to access the full rates of tax applicable to wine and alcohol at the present time.